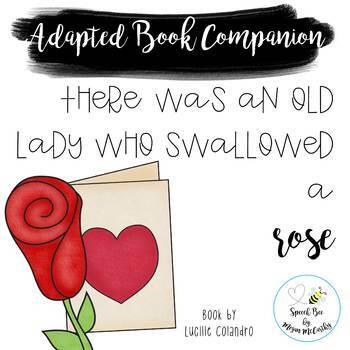 This adapted book for "There Was an Old Lady Who Swallowed a Rose" is perfect for emergent readers. Based on the book by Lucille Colandro, this adapted book is perfect for for speech therapy, helping students with sequencing, early intervention, and more! 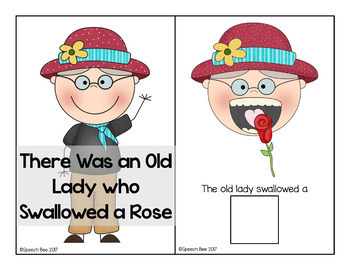 Perfect for preschool and kindergarten, these use simple repetitive sentences. The simple repetitive nature is easy for emerging readers to follow and with clear text and limited visuals. If you loved this adapted book, be sure to check out this thirteen book set targeting final consonants! Make sure you have access to a laminator and plenty of velcro before purchasing! Click the green store near my name from within my shop and be the first to hear about new products. E-mail updates will be sent with new products, which are 50% off for the first 48 hours! Be sure to leave product feedback to receive TpT credits for use on your future purchases! Your feedback is very valuable in helping me create useful, exciting products in the future.